The Church of Satan is a religious group that encourages people to accept their human nature and build their ego, as it is told in The Satanic Bible, written in 1969 by Anton LaVey. They do not worship or believe in Satan and they do not believe in God. "Satan" is just a symbol of freedom and the ego. The Church of Satan started in San Francisco, California, on Walpurgis night April 30, 1966, by Anton Szandor LaVey, who was the Church's High Priest until he died in 1997. In the 1950s Anton LaVey made a group called the Order of the Trapezoid, who later became the leaders of the Church of Satan. Some of the people at the events were: “The Baroness” Carin de Plessen (who grew up in a Royal Palace in Denmark), Dr. Cecil Nixon (magician, Odd person, and maker of robot), underground filmmaker Kenneth Anger, City Assessor(someone who figures out values of city property) Russell Wolden, Donald Werby (one of San Francisco’s most influential property owners), anthropologist(a person who studies culture and human development) Michael Harner, and writer Shana Alexander. Other friends of LaVey at this point were famous Science Fiction and Horror writers Anthony Boucher, August Derleth, Robert Barbour Johnson, Reginald Bretnor, Emil Petaja, Stuart Palmer, Clark Ashton Smith, Forrest J. Ackerman, and Fritz Leiber Jr. In its first year, the Church of Satan was in the news a lot because they performed a Satanic marriage of Judith Case and journalist John Raymond. The ceremony was photographed by Joe Rosenthal, who took the famous photograph Raising the Flag on Iwo Jima during World War II. Another event was the public funeral of Church of Satan member and Naval Officer Edward Olson, as his wife had asked. The Church of Satan was in many books, magazine and newspaper articles in the 1960s and 1970s. A whole documentary, Satanis was also made about it in 1970. LaVey was also in Kenneth Anger’s film Invocation of my Demon Brother, and helped as a technical adviser in The Devil's Rain, which starred Ernest Borgnine, William Shatner, and first showed John Travolta. The Church of Satan was also shown in Luigi Scattini’s film Angeli Bianchi, Angeli Neri, which in the United States was known as "Witchcraft ‘70". In 1975 LaVey argued within the Church of Satan by stopping the Church’s “Grotto” system(having Satanic rituals in caves) and removing people he thought were using the Church instead of doing things in the outside world. After that, LaVey hoped success in society would decide who did well in the Church of Satan. LaVey chose to do less interviews. People thought the Church might have ended, or even that LaVey might have died. In the 1980s some Christians, therapists who believed in recovered memories, and the news were saying Satanists were a criminal group. Members of the Church of Satan, such as Peter H. Gilmore, Peggy Nadramia, Boyd Rice, Adam Parfrey, Diabolos Rex, and musician King Diamond, were active in the news to deny the Church of Satan were criminals. These stories became known as the Satanic panic. The FBI later made a report saying these conspiracy theories were untrue. In the 1980s and 1990s the Church of Satan made many movies, music, films, and magazines about Satanism. Adam Parfrey’s Feral House publishing, the music of Boyd Rice, and the films of Nick Bougas, including his documentary Speak of the Devil: The Canon of Anton LaVey. They were also frequently in the newspapers. High Priest Peter H. Gilmore. After Anton Szandor LaVey's death, his partner Blanche Barton became head of the Church of Satan. 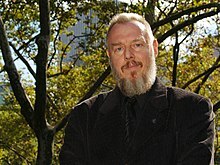 Barton is still in the Church; however, in 2001 she gave her position to long-time members Peter H. Gilmore and Peggy Nadramia, the current High Priest and High Priestess and publishers of The Black Flame, the magazine of The Church of Satan. The Central Office of the Church of Satan has also moved from San Francisco to New York City's Hell's Kitchen neighborhood, where the couple live. The Church of Satan does not recognize any other organizations as being Satanist[source?] though it does recognize that one does not need to be a member of the Church of Satan to be a Satanist. Some public figures have been involved with the Church of Satan, including Kenneth Anger, King Diamond, Teresa Hidy, David Vincent, Marilyn Manson, Aaron Joehlin, Boyd Rice, Marc Almond, Alkaline Trio guitarist and singer Matt Skiba and drummer Derek Grant, professional wrestler Balls Mahoney, professional wrestler Sterling James Keenan, journalist Michael Moynihan, death metal guitarist Matthew McRaith, Sammy Davis Jr. and the artist Coop. As the Church of Satan does not let people see the membership records, it is not known how many members they have. In October 2004 the Royal Navy officially recognised its first registered Satanist, twenty-four year old Chris Cranmer, as a technician on the HMS Cumberland. On June 6, 2006 The Church of Satan held the first public ritual Satanic Mass in 40 years at the Steve Allen Theater in the Center for Inquiry in Los Angeles. The ritual, based on The Satanic Bible and The Satanic Rituals, was led by Reverend Bryan Moore and Priestess Heather Saenz. Active Members begin at the First Degree. They must be approved for an Active Membership, and this is based on their answers to a long list of questions. Members cannot apply for higher Degrees, and the requirements for each degree are not open to the public. Promotion to a higher degree is only by being invited. Members of the Third through Fifth degrees are the Priesthood and may be called "Reverend." Members of the Fifth degree are sometimes called "Doctor," although "The Doctor" usually means Lavey. Some Active Members are called Agents, qualified to explain the Church of Satan and the philosophy of Satanism to the media and others who are interested. People seeking membership must be old enough to be seen as adults in the country where they live. The only exception made is for children of members who show they understand the Church philosophy and practices who wish to join. What they can do is limited until they reach adulthood. Memberships may be ended through a decision of the ruling body of the Church of Satan consisting of the High Priest, the High Priestess and the Council of Nine. Over the years, the Church of Satan has stopped then restarted the use of Grottoes -small groups for people who live near each other to work on projects or do ritual together, or be friends. Now that most people have the internet, the Church of Satan has decided people do not need to join Grottoes to meet other Satanists. If a group of Church of Satan members now wish to form a “magic circle” for something more than simple friendship and ritual, and can keep it active for a year and a day, the leader of the group can apply to have it called a Grotto and the leader called a Grotto Master. A grotto is expected to be secret, and only those they think are worthy are supposed to know about it. If a Grotto stops being useful it will be closed, as the Church of Satan has always done. Grotto Masters and Grottos do not represent the Church of Satan unless they have other authority to do so. Members of the Priesthood have the titles “Priest”/“Priestess,” “Magister”/“Magistra,” or “Magus”/“Maga.” The Council of Nine, which is the ruling body of the Church of Satan, and the Order of the Trapezoid who help in the administration of the Church of Satan are part of the priesthood. The High Priest and Priestess act as administrative chiefs and the two main public representatives. The current High Priest is Peter H. Gilmore, the current High Priestess Peggy Nadramia. The Church of Satan say they judge whether Active Members can join the Priesthood by their accomplishment in society and recognition within a profession rather than knowledge of the occult. They are expected to be able to speak about the Satanic philosophy, but do not have to represent the Church of Satan publically, and might choose to keep their membership secret so they can do what they want in the world, meet their own goals and those of the Church. Membership in the Priesthood is by invitation only. Zeena Lavey, Anton LaVey's daughter, was not a High Priestess of the Church and has left it. Satanists within the Church of Satan follow these rules on how to live. But Satanists do not view the Satanic sins, statements, and rules of the earth as things that someone has to try to do. They think it's human nature, rather than a Jew or Christian who the Church of Satan think have to try hard to fit in with the rules of their religion. The Nine Satanic Statements outline what "Satan" represents in the Church of Satan. Satan represents doing what you want, instead of stopping yourself doing it. Satan represents truly living instead of spiritual fantasies. Satan represents pure wisdom instead of lying to yourself and others. Satan represents kindness to those who deserve it instead of love wasted on ungrateful people. Satan represents revenge instead of loving your enemy, which Christians are told to do. Satan represents having responsibility for responsible people, instead of concern for those who live off other people's work. Satan represents man as just another animal. Satan represents all of the things Christianity has called sins, as they all lead to pleasure of some kind. Stratification - "No one should be protected from the effects of his own stupidity." Strict taxation of all churches - "The productive, the creative, the resourceful should be subsidized. So long as the useless and incompetent are getting paid, they should be heavily taxed." No tolerance for religious beliefs secularized and incorporated into law and order issues - "Amnesty should be considered for anyone in prison because of his alleged “influence” upon the actual perpetrator of the crime. Everyone is influenced in what he or she does. Scapegoating has become a way of life, a means of survival for the unfit. As an extension of the Judeo-Christian cop-out of blaming the Devil for everything, criminals can gain leniency, even praise, by placing the blame on a convenient villain. Following the Satanic creed of “Responsibility to the responsible,” in a Satanic society, everyone must experience the consequences of his own actions—for good or ill."
Development and production of artificial human companions - "An economic “godsend” which will allow everyone “power” over someone else. Polite, sophisticated, technologically feasible slavery. And the most profitable industry since TV and the computer." The opportunity for anyone to live within a total environment of his or her choice, with mandatory adherence to the aesthetic and behavioral standards of same - "Privately owned, operated and controlled environments as an alternative to homogenized and polyglot ones. The freedom to insularize oneself within a social milieu of personal well-being. An opportunity to feel, see, and hear that which is most aesthetically pleasing, without interference from those who would pollute or detract from that option." These goals have another purpose, as said by the author, to let non-Satanists see how much they agree with Satanic views. Pentagonal Revisionism is the application of Satanist beliefs to society and economics with five goals to encourage members. Other books, such as The Satanic Bible,say more about Satanic dogma. ↑ "Official Church of Satan Website". ↑ Interview with Peter H. Gilmore, David Shankbone, Wikinews', November 5, 2007. ↑ ""Anton LaVey Legend and Reality"" (html). Retrieved 2007-12-23. ↑ ""Church of Satan Member Links"" (html). Retrieved 2007-11-03. ↑ "Navy approves first ever Satanist". 24 October 2004 – via news.bbc.co.uk. This page was last changed on 12 February 2019, at 15:32.